E-bike powerhouse Bosch and legendary designer Troy Lee have set up quite a race series this year, and it keeps growing. Where they had two races last year, the number of races has doubled for 2018. The first one was at Vail Lake near Temecula, California. This one was in Big Bear at the Snow Summit Resort in conjunction with the Crafts N Cranks festival. The back corner had a unique and very steep climb out of it that proved to be a bit of an equalizer. 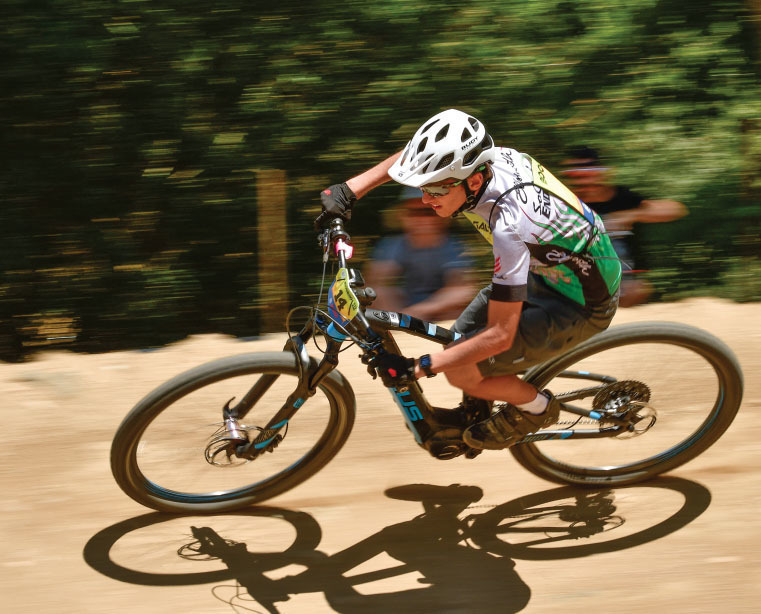 Last year the same race was scheduled, but it was dropped because the Forest Service said no to e-bikes. However, in a growing sign of the times, this year they had a change of heart and let the event happen as scheduled. The track was significantly longer than either of those at Vail Lake or Mammoth. Replete with wooden bridges, an interesting huge berm with a steep climb at the back, a big tabletop that some riders are getting stylish air over, and a tight chicane that the most skilled are taking with quite a bit of speed. Unlike Vail Lake’s course, there was no big climb involved. Each track had its own distinct personality. 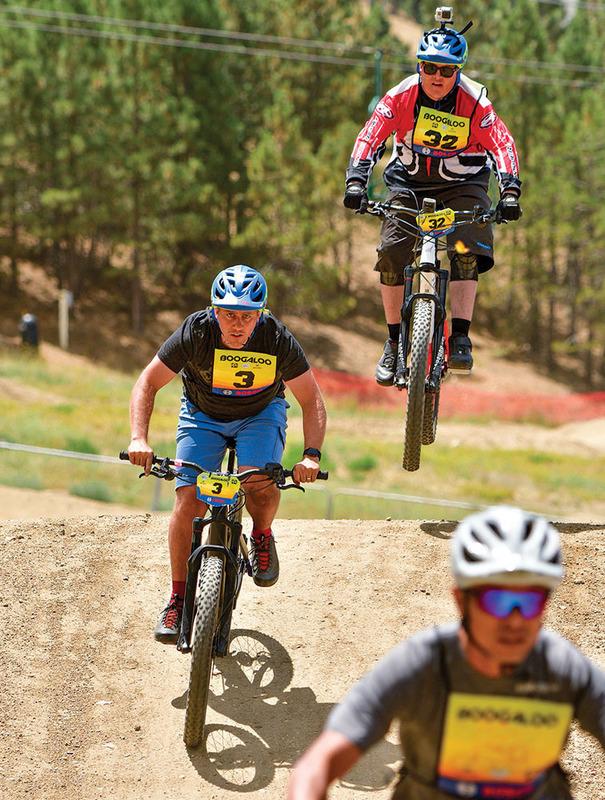 The start line was at the lowest point, so nabbing the holeshot required the power of muscle and machine in tandem. Once at the first corner, the riders run three laps on to qualify for the main event in each class. There are three classes; Youth, Open and Pro. The kids racing Youth class are doing it for a Troy Lee gift bag full of goodies. Open class gets a set of Bosch tools. Pro class gets cash plus a set of Bosch tools. There was a lot on the line. Riders picked their bike during the demo before the race or were allowed to bring their own, provided it was a Class 1 bike (20 mph, no throttle) and passed inspection. 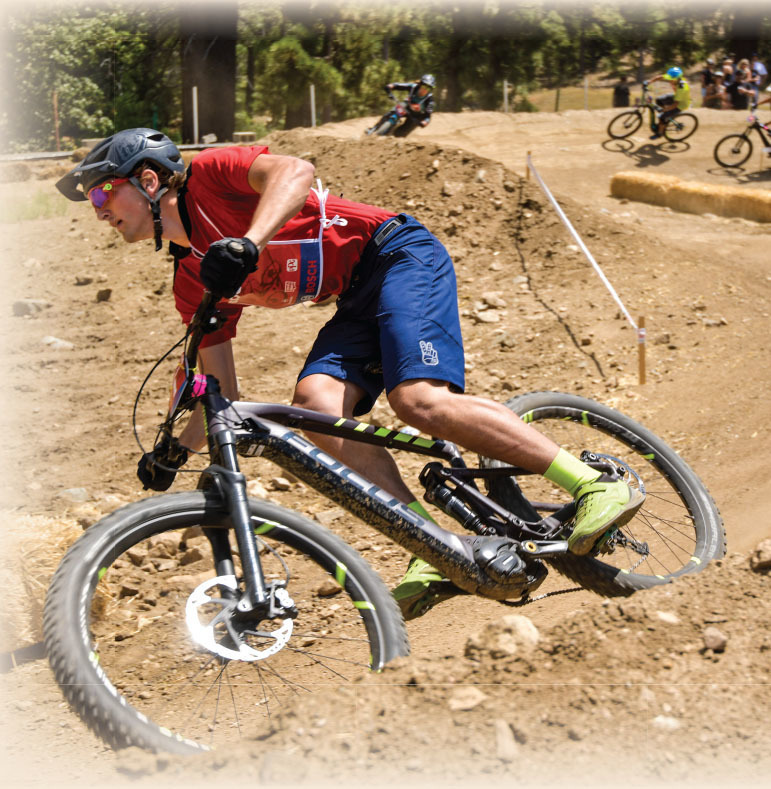 We did note that many of the top finishers were riding Focus bikes. The corners were tight, especially for the speeds of the top riders. As each rider crossed the finish line in the final, officials randomly checked the bikes to make sure they were legal Class 1 bikes. That means no throttles, and the motor cuts off at or before 20 mph. Lance Nelson was racing a Hi-Power Cycles Scout. He came across the line fifth, meaning a paycheck and a set of Bosch tools. 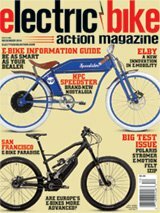 Given the brand’s reputation for highpowered hot-rod bikes, it was hardly a surprise that his bike was chosen for a check. The Scout’s original spec can get it pretty far over 20 mph, per customer desire. Jason Ganske rails a corner. As a new tradition, the winning pro not only gets his prize money and tools, he gets to keep the checkered flag. Turner Conway celebrates his hardearned victory. The test ride came up at over 20 mph, disqualifying the bike. We talked to the guys at HPC afterwards, and they said they carefully reprogrammed it to cut at or below 20 mph. 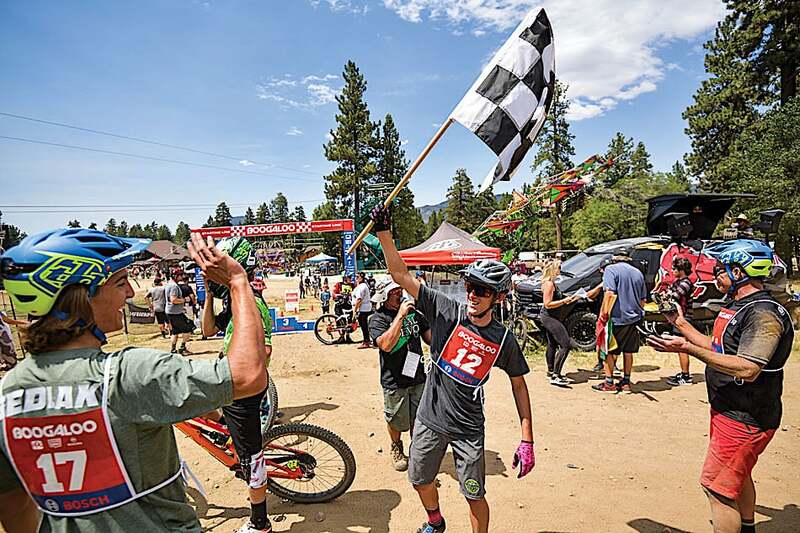 An argument ensued, and the promoter stepped in and offered to take a second test ride on the bike, and he came back with it being legal, which restored Lance’s fifth-place finish. Jason Ganske, an up-and-coming 17-year-old racer who was diagnosed with prepubescent lymphoblastic leukemia over three years ago. Although he’s still going through chemotherapy to ensure the disease is in remission, he’s still racing while having the treatments. It’s amazing that he’s raced two of the Boogaloo races less than a week after chemo treatments both times. That’s the time when the ravages of chemo hit hardest and the side effects are at their worst. What’s far more amazing is how he’s done in those races. In Vail Lake, he won his heat race and earned second in the main. At Snow Summit, he won both! It’s incredible that he’s able to ride at all, much less race at a high level. We asked him what that’s like and how his training has been. 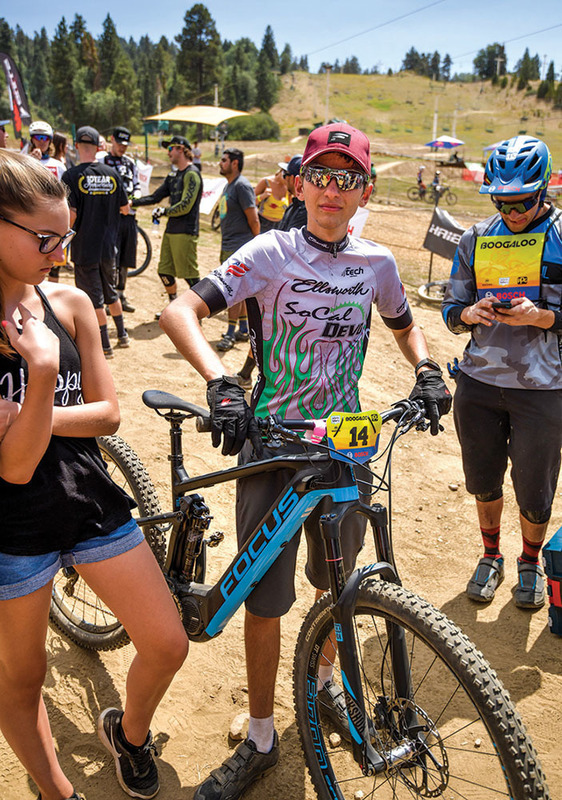 “Mountain biking is one of those things, if you miss like three days, you’re fitness is going downhill. So, if you’re not pedaling or training for three days, you’re just slowing down. It gets tough, because you get to that point where you can start building back up to your best potential, you get chemo. I was getting chemo all the time for a while, then it got to the point where I was just doing that once a month. I’ve been getting that for about two and a half years. You kind of start feeling better, you get going again, then you get hit with another chemo. “When you get chemo, sometimes it would take a week or a week and a half to recover, even to be able to really train hard. It’s definitely tough. It’s been helpful, though, because I’ve had a coach the entire time who has been able to give me training workouts that I can try and do even if I’m not feeling great. Jason has an incredibly positive attitude, as you might guess. He wouldn’t be riding, let alone winning, without one. By the time you read this, he will have finished the last of his chemo. We can’t wait to see what level he achieves when he’s off the chemo!